People with mental health disabilities are vastly overrepresented in the population of people who experience homelessness. Of the more than 550,000 people in America who experienced homelessness on a given night in 2017, 1 in 5 had a mental illness. The proportion of people experiencing chronic homelessness with mental health disabilities was even higher—nearly 1 in 3. Despite this fact, the reality is that most people with mental illness fortunately do not experience homelessness: While about 20 percent of all adults in the United States have a mental illness, less than two-tenths of 1 percent of people in the country experienced homelessness on a given night in 2017. While all individuals and diagnoses are unique, mental health disabilities often cause a variety of symptoms that substantially interfere with a person’s daily life and activities, including maintaining steady employment or paying rent and utilities on a regular basis. Symptoms such as illogical thinking and withdrawal, along with the intense stigma surrounding mental illness, can also make it difficult for someone with a mental health disability to seek treatment. Furthermore, the extreme stress, anxiety, isolation, and sleep loss that come with homelessness worsen mental and physical health problems, demonstrating the vicious cycle between homelessness and mental illness. But it does not have to be this way. The past several decades reveal the role that policy has played in connecting mental health disabilities and homelessness. In 1963, then-President John F. Kennedy signed the Community Mental Health Act, which was intended to fund the construction of 1,500 community-based treatment facilities nationwide in order to provide services and treatment to people with mental illness in their own communities, rather than in state mental hospitals. As a result, many state mental hospitals were closed in the decades that followed, and patients moved out of neglectful, inhumane hospital wards and into communities. Yet because of changes to the funding formula for community mental health centers, as well as policymakers’ incorrect assumptions about the ability of patients’ families and networks to support people leaving institutionalized settings, those with mental illness have struggled to get their service and support needs fully met in the community. Today, the legacy of this troubled policy—known as deinstitutionalization—means that people with mental health disabilities and people experiencing homelessness are overcriminalized and overincarcerated, with jails effectively serving as the country’s largest psychiatric care providers. Coupled with deinstitutionalization, the nation’s growing affordable housing crisis has exacerbated conditions for people with mental health disabilities who experience homelessness. The leading cause of homelessness is a lack of affordable housing. Therefore, the key to ending homelessness for virtually all populations—with and without disabilities—is affordable, accessible, permanent housing. Yet with climbing rents, stagnant wages, and shrinking public housing stock and project-based subsidies, affordable housing is becoming harder to find. And for people with disabilities, the situation is even more dire because affordable and accessible units are in shorter supply. Nearly 5 million households, including almost 4 million children, rely on federal rental assistance programs for housing. Despite a growing need for housing assistance, only 1 in 4 eligible low-income renters receives the help they need. This affordability crisis affects a growing number of people but is especially challenging for those with mental health disabilities who are experiencing homelessness. In addition to affordability problems, when searching for housing, people in this group face stereotypes and discrimination, including from landlords who discourage them from applying. 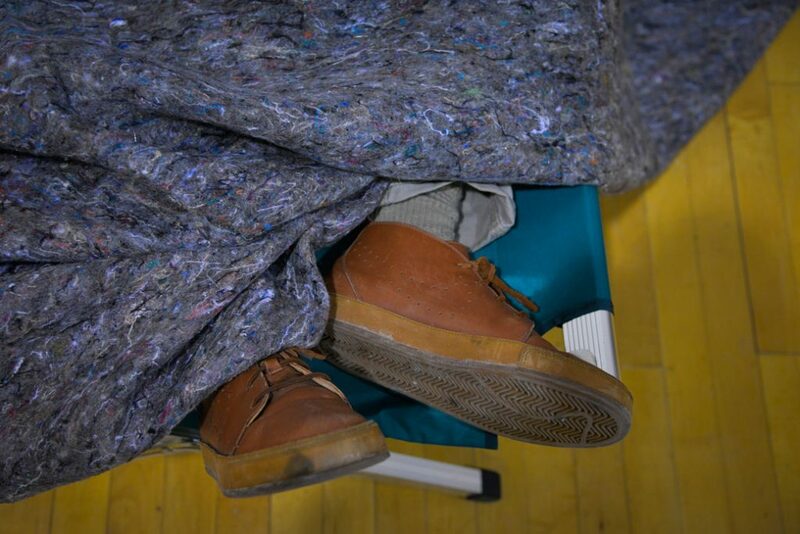 Lengthy and frequent periods of time spent either in shelters or unsheltered were once incorrectly considered the standard experience of homelessness. Today, however, these characteristics are understood as indicators of chronic homelessness, which affects only 10 to 15 percent of all people who experience homelessness. Because people who experience chronic homelessness are often the most visible and most vulnerable, they are frequently mistaken as representative of the entire homeless population. Moreover, media coverage too often reinforces inaccuracies about the causes of homelessness. Stories frequently conflate homelessness, mental illness, and substance use disorders, which contributes to the false narrative that homelessness is an intractable problem. This also reinforces the inaccurate belief that homelessness is a consequence of a failure of so-called personal responsibility, which, in turn, undermines public support for government solutions. The notion that homelessness is caused by individual shortcomings also prompts government to create unproductive and often costly Band-Aid interventions. For example, some cities have passed laws banning sleeping in public places and have used hostile architecture to prevent people from lying down. Many cities also offer one-way bus tickets in the hope that people experiencing homelessness will leave, while others spend time and money clearing encampments without offering assistance, services, or alternative places for people to stay. People who experience homelessness need to have the option of entering accessible, low-barrier emergency shelters where they can safely stay while formulating a housing plan. Yet in shelters, accessibility problems abound for people with disabilities—as well as for other marginalized groups, such as lesbian, gay, bisexual, and transgender (LGBT) people—despite the fact that these facilities serve an increasingly vulnerable and disabled population and that the people living in shelters are almost three times as likely to have a disability compared with the general population. Coupled with other concerns, including overcrowding, cleanliness problems, and burdensome rules, some people choose not to stay in shelters. Regardless of whether someone enters a shelter, permanent supportive housing is a highly effective housing solution for people with chronic patterns of homelessness, as it pairs a renewable subsidy with intensive services such as health care coordination, employment assistance, substance use disorder counseling, and more. People with shorter homelessness histories and fewer or better-managed disabilities may be successful with a lesser intervention, such as help paying a security deposit and first month’s rent or rapid re-housing, which offers a short-term subsidy and housing-focused case management. Like federal rental assistance programs, however, homeless assistance grant-supported programs are currently funded at unsustainably low levels. In addition to providing accessible, affordable, permanent housing, increasing access to health care is crucial to improving the health and housing outcomes of people at the intersection of mental health disabilities and homelessness—individuals who are more likely to have life-threatening medical conditions and encounter barriers to accessing treatment and preventive care. Specifically, protecting the Affordable Care Act (ACA) and expanding Medicaid without enrollment-reducing mechanisms such as so-called work requirements—which often function as punitive time limits—is critical to improving coverage and care for people with the greatest needs. And for people with acute illnesses and health needs who experience homelessness, it is essential for communities to offer high-quality care regardless of the patient’s ability to pay. President Donald Trump, Secretary of Housing and Urban Development Ben Carson, and congressional Republicans are determined to defund federal rental assistance programs, repeal the ACA, and slash Medicaid funding. Doing so poses major threats to the health and well-being of people with mental health disabilities, people who experience homelessness, and, especially, people at the intersection of these two groups. If the current trends of diminished federal support for affordable housing and attacks on the ACA continue, the barriers these groups face in obtaining housing and health care are sure to increase. It is important to recognize that public policies have played a critical role in creating and worsening conditions for people in both these groups. As such, policy will also be key to developing thoughtful, lasting solutions. Heidi Schultheis is a policy analyst for the Poverty to Prosperity Program at the Center for American Progress. The author would like to thank Hannah Leibson, former intern for the Disability Justice Initiative, for her research assistance; and Azza Altiraifi, research associate for the Disability Justice Initiative, for her fact-checking assistance. The author would also like to thank Rachel West, Katherine Gallagher Robbins, Rebecca Cokley, Maura Calsyn, and Michela Zonta for their policy expertise and guidance. *Author’s note: In this column, the terms “mental health disability” and “mental illness” are used interchangeably.